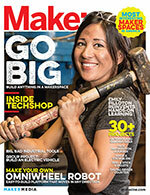 Jennifer Turliuk is the Co-Executive Director (Business) & Chief Happiness Officer at MakerKids. Jennifer’s work has been featured in the New York Times, Forbes, Huffington Post, Fast Company, CBS national TV, and more. Her career highlights include doing marketing and PR for the Matterform 3D Scanner crowdfunding campaign (which raised over $471K – the most-funded Indiegogo campaign outside the US), helping build a 3D printer for a music video, launching an SMS-based disaster relief project during Hurricane Sandy, being selected as a Startup Chile entrepreneur (as part of a program run by the Government of Chile to foster entrepreneurship locally), creating her own self-education program which involved being 1 of the top 6 finalists in a competition to shadow Dave McClure of 500 Startups, leading the Canadian launch of Tide Pods (P&G’s biggest launch in 27 years), running Canada’s largest business plan competition (the Queen’s Entrepreneurs’ Competition), writing one of Forbes Greatest Hits articles, speaking on a panel discussion with Peter Thiel (founder of Paypal), doing a TEDx talk in Spanish, being invited to join MaiTai (a group of pro kiteboarders and entrepreneurs), and DJing for Red Bull. She attended the Graduate Studies Program at NASA’s Singularity University and business school at Queen’s University. In her spare time, she does independent marketing and strategy consulting and enjoys salsa dancing, extreme sports (such as kiteboarding), improv, 3D printing, and building electronic creations. Follow her on Twitter: @jenniferturliuk. Andy is an innovator and a thought leader in education and connected learning. His passion and purpose are to empower kids and adults to invent the future! Co-founder of the non - profit maker education organization STEAMLabs. Toronto-based MakerKids is one of the world’s only makerspaces specifically designed for kids, and many people have asked us to share our recipe. We think of it as a brunch — there are many ways to make it delicious. Take the pieces of our recipe that work for you and make it your own. We’re also available to help with this — we envision a future where there are MakerKids chapters all over the world. 1. Dedicated Space: Even if just a cart, having a space that’s set up to be inspiring and safe allows kids to feel like they have permission to take ownership and be creative beyond what’s normally accepted or expected of them. 2. Real Tools: We have the same real tools that any adult makerspace would have. 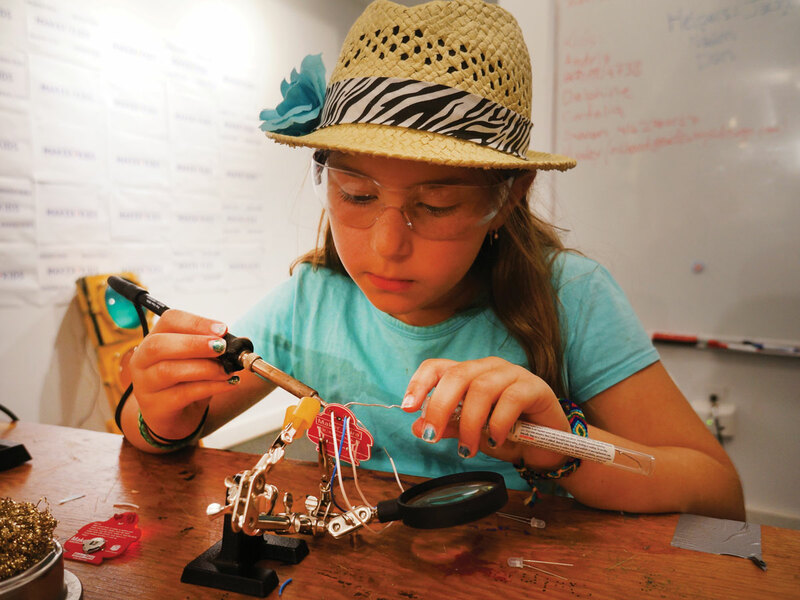 Kids as young as 3 use drills, saws, and soldering irons. To the frequent question “Can you do this for me? You’re better at it than me,” our answer is “That’s why you should do it! Then you’ll get as good as me.” We’d rather help them learn to do it safely and become more comfortable, or find another way to achieve their goals. This helps them to develop feelings of competence, responsibility, and leadership. 3. Process Over Product: Value experiential learning. We celebrate the fact that they’re making, not just what they make. The point is not to take home some shiny object that they’ve made. We emphasize that it’s okay to fail — it’s just an opportunity to learn. 4. Interest-Driven: We try to let kids’ creative interests define projects as much as possible. If we tell them exactly what to make and how, they quickly lose interest. If they’re following their creative interests, they’re much more engaged. Recently, a group of kids were very interested in vehicles, so they designed and built a hovercraft. They learned a lot of skills as they went along: 3D printing (for the lift turbine), motors, Arduino programming, and more. When it failed to get off the ground on the first try, they got right to work reinventing the skirt to reduce weight and optimizing the turbine airflow. Every activity we do, no matter how short, we incorporate something creative, something open-ended. Let them make it their own! 5. Kids Teaching: We encourage kids to share their knowledge with each other and with their teachers. A low student-to-teacher ratio is valuable in any learning environment, so encourage everyone to be teachers. Kids teaching also gain so much self-confidence. When a new kid asks how to hook up an LED and another kid says, “I can show you that,” everyone is growing. As the kids grow as makers and teachers, we encourage them to volunteer as helpers in classes. The next step is for them to lead classes themselves. Sometimes kids know more than we do, especially on topics they’re passionate about. In our Minecraft classes, the kids are the experts and we learn from them all the time. We make sure to listen and let them teach us, too. 6. Exhibition: Each program has a presentation to the parents, which kids get really excited about. It helps them to organize their thoughts, knowing that at the end of their project, they’ll have to explain it to someone else. Having a deadline also helps them focus and move forward. 7. Community: We connect to the Toronto community and the global maker community through events like Maker Faire, local community festivals, school fun fairs, participation in online discussions, and interfacing with folks from other maker companies. We work with many other kids’ organizations — for example, we’ve worked with kids in a music program to build props for their performance. Find out what the makers in your community are passionate about and connect with them. So that’s the summary of our recipe — the mix that makes our youth makerspace work. We want to know how we can help you to do making with kids in your community. We’re developing curriculum modules for summer camps, after-school programs, schools, and more. Our board of advisors includes the CEOs of Maker Media and Arduino, and we’ve developed curriculum modules for clients and sponsors such as Intel and 3D Systems. Email us at [email protected].